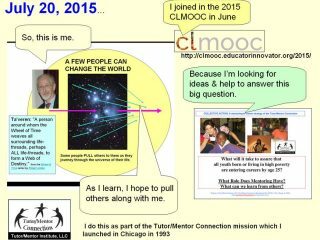 For CLMOOC 2016 Make Cycle 2, we are reciprocating with gratitude and finding new ways to connect by reciprocating with gratitude and generosity. Inspired by Susan Watson, I am remixing the online media of various friends to honor them. I did this by scanning their various online feeds (Twitter, blogs, Flickr, FB, etc.) and gathering up pictures and quotes I feel well represent the best of these people. This make can be extended in a variety of multimedia forms. Try it, and post your examples here.